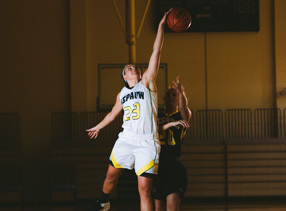 March 3, 2008, Greencastle, Ind. 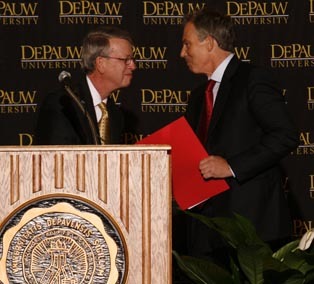 - "We have a massive challenge ahead of us," Tony Blair told an audience of 4,300 at DePauw University tonight. The former prime minister of Great Britain and Northern Ireland declared, "The world is changing, and it's changing fast," and he stressed the need for heads of state to "exercise global leadership." 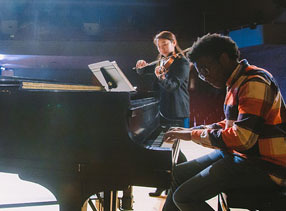 Blair's Timothy and Sharon Ubben Lecture in the Lilly Center's Neal Fieldhouse was titled, "Challenges and Opportunities Facing 21st Century Citizens of the World." [Download Video: "Mr. Blair's Fear" - 2111kb] "If I have a fear at all about our countries in the 21st century, it's that we just don't understand how fast the world is changing and how fast we have to adapt," says Blair, who stepped down as prime minister in June and is currently serving as the Middle East Quartet Representative. "The Middle East -- and I'm there a lot -- is a region in transition; the question is, in transition to what? And that's why it's important that we exercise this global leadership now." 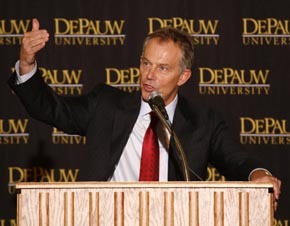 Blair believes "it's urgent -- the world can't wait for us to discover 5, 10 years down the line that we missed our opportunity to shape the 21st century in the right way." 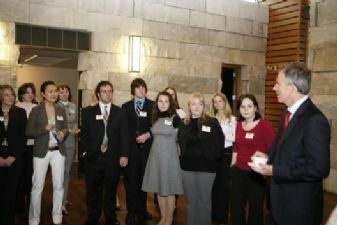 [Download Video: "Tony Blair's Entrance" - 2005kb] Blair -- who took the stage as the DePauw University Band played a fanfare -- received several standing ovations from the crowd which began lining up outside the Lilly Center hours before the doors opened at 5 p.m. This year, China will invest more in Africa -- where some three million children die of preventable diseases each year -- than the European Union and America together, Blair noted. He pointed to an emerging middle class in Russia, and the fact that India produces more qualified graduate engineers than the whole of the European Union put together. Climate change will force us to alter our lifestyles, Blair continued. "Essentially, every economy in the world is being changed rapidly, fundamentally by globalization and technological change, so that there are new economies being created, particularly in the Far East." Vietnam, he says, is "particularly dynamic" and will be a "first world economy" in only a few years. "The center of gravity is shifting eastward," according to Blair. "They are global challenges. 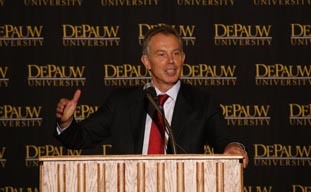 No one country can meet those challenges," stated Blair, who admitted to the crowd that he is familiar with the speech Harold Macmillan delivered at DePauw's 1958 commencement. It was carried live on national television from Blackstock Stadium while Macmillan was the sitting prime minister. [Download Video: "Blair on Macmillan and Interdependence" - 2204kb] "He spoke then about the interdependence of the world, and he spoke then about the need for America and Britain to realize the world as it was after the post-war years was not going to be the world as it was going to be in the years to come. And he was absolutely right," Blair says. "And what has happened today in the year 2008 is that this idea of interdependence that was a sort of political cliché has actually come to fulfillment. 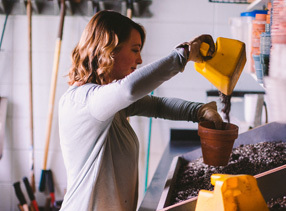 We are interdependent today. No one country is strong enough, not even this country -- powerful and great though it is -- is strong enough to be able to handle and to meet the global challenges that we face on its own." What is required, says Blair, is a "global coalition to achieve the global action that is necessary for our future, based on globally acceptable values." But while the world is shifting quickly, "the political institutions and the political attitudes needed to overcome these challenges are shifting far too slow." The "left-right debate" needs be pushed aside by an "open-closed" dialogue. "In other words, are we open in our attitude? Are we prepared to be engaged rather than isolationist?," Blair asked. "Are we prepared to be open in terms of trade rather than protectionist? Are we prepared to be open to the benefits of a world that has shifted very, very fast by globalization, or do we close down? Do we say, no, in the face of these challenges it's best to protect what we have -- to ward off migration, to make sure that we may look after ourselves but we don't go out and get engaged with the world. I believe that distinction -- whether you're open in your attitude to the world or closed -- will be important in the years to come as left versus right." 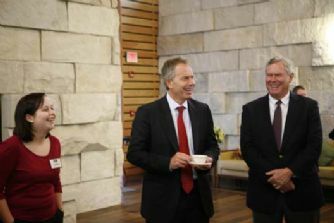 Blair added, "I think there's tremendous possibility in this world today, precisely because of the way the world changes. But there's also an urgency about the challenges that it poses." He asserted, "This is a great country. We need its leadership in the world, and that leadership has got to be based on values that unite, with a coalition that is broad enough to address the world that is emerging as well as the world that has already emerged. And it has to be an agenda that allows us to act effectively and also quickly." 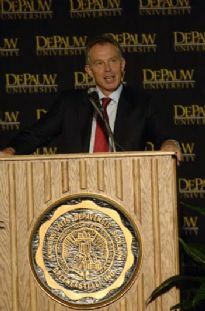 During the question-and-answer session, in which DePauw student journalists presented Blair with questions that had been e-mailed, the former prime minister was quizzed about his support for the Iraq war. [Download Video: "The Terrorist Threat" - 1821kb] "The best I can do is to take the decision I think is right. Now I don't know whether I am right or not; lots of other people have different judgments. But what I know about this terrorist threat is this: it is real, it is in large parts of the world, it has got a real purchase on a signficant part of street opinion in many of these Muslim countries, and if we show for a moment weakness in the face of it, we're gonna lose this battle. And I tell you, we cannot afford to lose it, not for us and not for the generations to come." As a cold rain fell outside, Blair opened his talk by thanking the large crowd "for making me feel so welcome here today, including putting on the British weather for me, which is most appreciated." 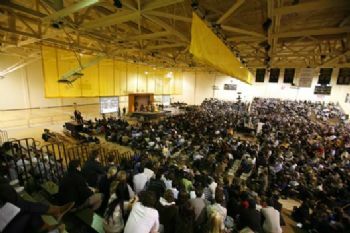 As the audience laughed, he noted that as the fifth British Prime Minister to visit DePauw, "You saved the worst for last." 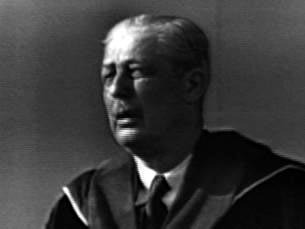 Harold Macmillan, whose grandfather was a graduate of the University, provided DePauw's 1958 commencement address as the sitting prime minister. Harold Wilson presented a 1981 talk. 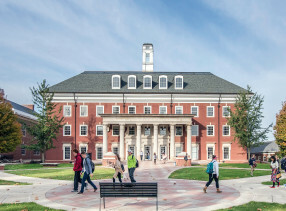 The Ubben Lecture Series brought Margaret Thatcher to campus in 1992 and John Major in 2001. 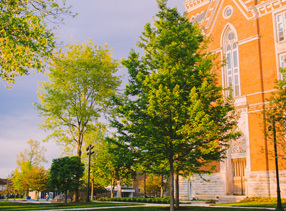 Created by a gift by 1958 DePauw graduates Tim and Sharon Williams Ubben, the Ubben Lecture Series was established in 1986. 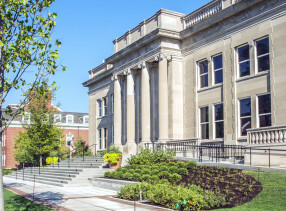 This academic year has included appearances by PostSecret founder Frank Warren in November and Ralph Nader in September. 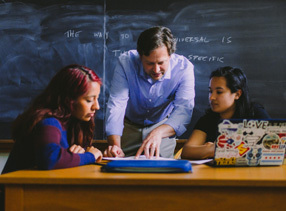 To view a complete roster of Ubben Lecturers, which includes links to video clips and news stories, click here.